Seeing the boroughs from sky-high heights is nothing new thanks to all the supertall towers in Manhattan, but it’s not as common to have a panoramic view of our main island, which is why we had to share this video. JDS Development posted the short clip on their Instagram stream yesterday that shows potential views from their upcoming mixed-use skyscraper planned for Downtown Brooklyn using air rights from the Dime Savings Bank site. If constructed as intended, it will be the first 1,000+ foot tower outside of Manhattan. The nine-second video, whose camera height seems nearly eye-level to the 1,368-foot roof of One World Trade Center, depicts far-reaching, panoramic views to the west and northwest over Manhattan and beyond. The tower site at 340 Flatbush Avenue Extension is adjacent to the iconic Junior’s Restaurant and is being co-developed by the Micahel Stern-led JDS Development Group and the Chetrit Group. Last month, the team closed on the purchase of the neighboring Dime Savings Bank of New York for $90 million whose air rights will most likely be transferred to the tower site, allowing for a building upwards of 600,000 square feet. It’s also been suggested that the tower could rise higher than the 1,250-foot Empire State Building, which would not only make it the tallest building in the outer boroughs, but the tallest skyscraper on the East Coast outside of Manhattan. Building permits on file from June 2014 detail a much smaller tower of 65 stories and roughly 400 residential units. SHoP is recorded as the architects of record; the firm is also handling another supertall tower for JDS at 111 West 57th Street. 340 Flatbush is one of many new projects going up in Brooklyn; in fact, the northern end of the borough alone will get 22,000 new apartments over the next four years, according to a report from CityRealty. 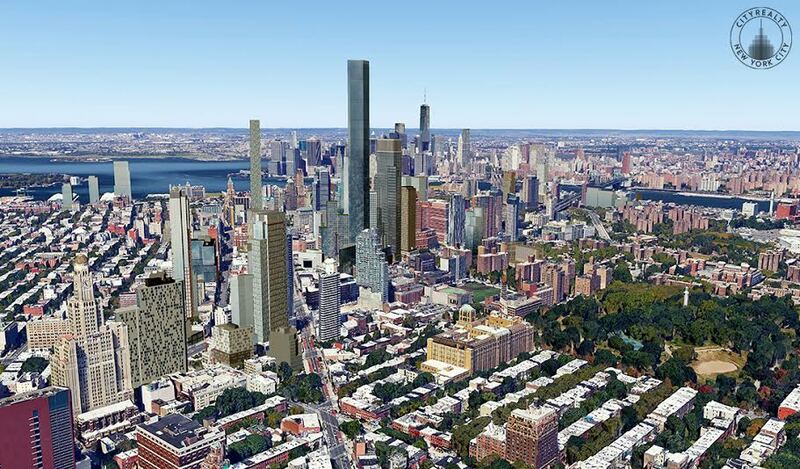 Stay updated on the development of 340 Flatbush Avenue Extension at CityRealty.